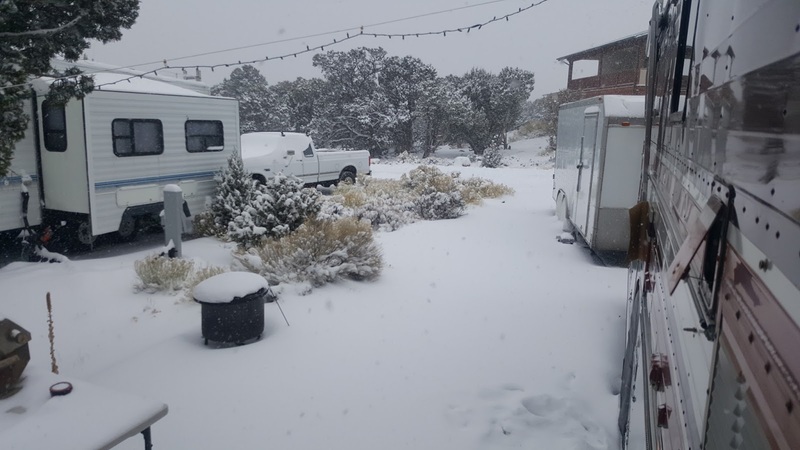 5:43 am - Wednesday - February 28th - Grand Canyon - 22º F, 91% humidity, wind 3 mph out of the west.....forecast is for partly cloudy skies with a high of 39º F. Was supposed to rain/snow last night, but there is no new snow on the ground this morning.....yay! The snow will continue to melt and, maybe, we'll have a lot of bare ground around the Newell and trailer by this weekend.....18 days away from liftoff.....yay again! The sun now rises at 6:59 am, and sets at 6:22 pm, and as a result the daytime hours are getting longer. We have reached the end of February and in 18 hours we will be counting down our last 18 days at Desert View. Tuesday was no different than prior work days......it was slow until the last 60-90 minutes of my shift at which is the time frame in which most of my sales occur. I ended up dropping a little more than Monday.....$83.76.....exactly $6 more. TLE again reported a cash drop of over $400 once again. Since most of the snow around the General Store has melted customers are no longer tracking in snow and ice so there was no need to wet mop the entire store floor Tuesday. I did a little mopping in the foyer, and immediately in front of the entrance area, but that was it. I did have to dry mop, however, as folks were tracking in a lot of small rocks. The NPS spreads a lot of small crushed rock on the sidewalks after a snow storm to give people walking more traction and to avoid 's. The downside is a lot of it gets tracked inside the stores. As has been the case the past few days I spent most of my shift reading and marking time until about 11 am when the foot traffic began to increase. TLE was right there at 11:55 am to relieve me, and I was on my way home by 12:25 pm. We were supposed to have partly cloudy skies Tuesday, however, we actually had clear blue, windless skies.....nice! Even though I was pretty sure the heater blower fan was toast on our Splendide I decided to take the top off and confirm that it was toast, and not just a loose wire. In preparation for this operation TLE had emptied the shelving in the pantry above the Splendide so I could get right at it after I got home. Within about 15 minutes it was clear that my original diagnosis was correct.....the motor is toast. I put everything back together and took a nap. Around 4 pm John and Lisa stopped by on their way out of Desert View to say their 'until next times' and were on their way back Colorado in a cloud of dust. It was a great 5 days with them. TLE was home right at 5:30 pm, and quickly went about putting all the pantry items back in the pantry before preparing a wonderful salmon dinner replete with asparagus and salad. We opted to watch a few more episodes of 'Godless'. This is a limited one season series which has just 7 episodes.....we have now watched 5 episodes and are totally captivated. I was in bed just before 9:30 looking forward to our 'Friday' (Wednesday) after which we will be off work Thursday and Friday. 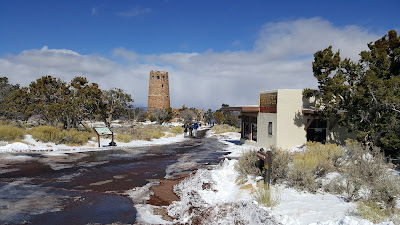 5:39 am - Tuesday - February 27th - Grand Canyon - 25º F, humidity 44%, wind 4 mph out of the south by southeast.....cloudy today with rain/snow this evening around 5 pm ending around 6 am Wednesday morning.....here we go again. 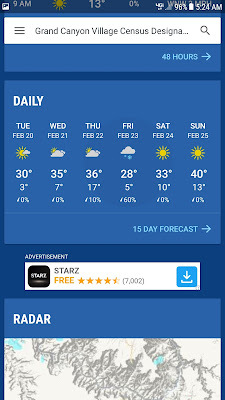 Forecast high for today is 41º F.
Monday was a gloriously sunny, windless day.....it got all the way up to 44º F! One thing I have learned is that the daily high temperature is a relative thing. If it's been in the 20's for a while 44º F feels relatively warm, and when you combine that with lots of sun, and no breeze it really feels warm. When the overnight lows stay in the high teens, or low 20's we never have any problem with our water line freezing at the hose bibs. We don't have to have heaters on until early morning, and when I come home from work around 12:30 pm I can leave the heaters off most of the afternoon. I know these seem like small things, but they make all the difference. I opted to walk the road to and from work Monday.....no point in fighting the snow in the forest until more of it melts, although with another storm coming in Tuesday afternoon I am sure that walks in the woods will be postponed indefinitely for the near future. I dropped $77.76 on Monday, although the day felt a little busier than that to me. TLE actually dropped over $400, but she said it didn't feel that busy to her. Again, I guess it's all relative. After getting the retail part of the store swept, mopped, and in order I settled down to reading a book in between customers. When I read the time seems to pass quite quickly.....I know there are still 60 seconds in each minute, and 60 minutes in each hour, but it feels like less when I get engrossed in a book.....relatively speaking. Since the weather will deteriorating on Tuesday I chose to preemptively empty the black tank on Monday. While it may not be raining, or snowing when I get home Tuesday it may be windy and cold so I opted to dump the tank a day early so it could be done in relative comfort. It appears the dryer portion of our Splendide 2000 washer/dryer has bitten the dust, and parts are no longer available to repair/replace the blower. If parts were available it would be an easy fix to pull out the old blower and install a new one......maybe a 30 minute job. I had considered buying a 'donor' machine to cannibalize parts from, but the only one available on eBay cost $700 to buy, with another $200 plus to ship it to me, and I would need a place to store it. Finally, Monday, I came across a late model Splendide 2000 for $700 shipped (includes shipping). 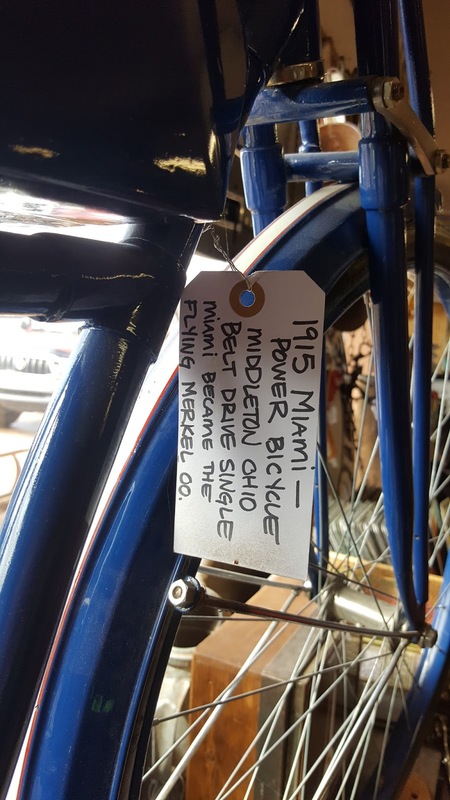 It was removed from some sort of a cruising boat where it had been lightly used. 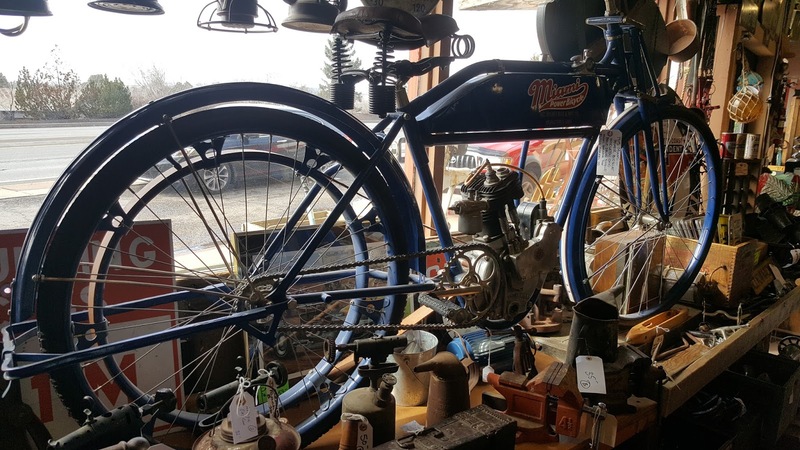 Since it was rarely used the owners decided to remove it so they could utilize the space it occupied for more storage space. Our Splendide is over 30 years old and it makes more sense to replace it with a newer model so we won't have to keep worrying about things breaking on the old one, which they no doubt will. For the time being we can still wash clothes and then hang them up to dry.....a minor inconvenience. I'm having it shipped to our home address in SoCal so I can install it while near a hardware store in case I need to replace anything like the vent hose, or water lines. At any rate, I have found a relatively inexpensive solution for replacing our Splendide......new ones cost around $1,300. We headed over to John and Lisa's 5th wheel around 6:30 pm for our last evening together. We, once again, had a delightful time....they will be leaving early afternoon on Tuesday, but we will hope to hook up with them in the near future when we are in their neck of the woods. 5:38 am - Monday - February 26th - Grand Canyon - 21º F, 50% humidity, wind 3 mph out of the south by southwest.....forecast is for sunny skies with a high of 43º F.....ahhh.....back into the 40's after being in the 20's and 30's for a week! There are even a few 50º days in the near future. With two straight days of sunny skies the snow from our two storms last week is beginning to melt, but if we get anymore significant snow in the near future I'm not sure it all will be melted by the time we depart on March 18th. And that is my mindset right now.....I'm thinking forward a few weeks to what will need to be done to get our Newell ready to roll again after being static for almost 4.5 months. There is a lot of stuff to be put away, and I am praying for ground clear of snow, and temps back in at least the 50's. With three days left in February we are on the brink of 'Spring Break', and 'March Madness' (NCAA basketball tournament)......one of my favorite times of the year ('March Madness', not 'Spring Break'). My mind, in spite of my efforts to stay rooted in the present, continues to drift to the future when there will be days of sleeping in once again, days of no working, days of riding my bicycle, and days of 60-70º days in SoCal. I'm only human, and in my mind I'm pretty much done living in perpetual cold here at the Grand Canyon and ready to return to lower elevations and warmer weather. 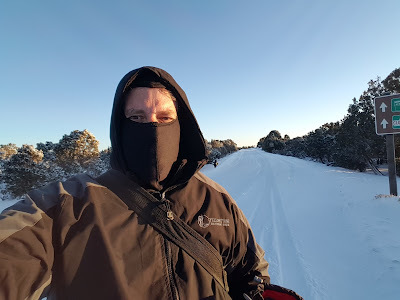 On my way to work Sunday I opted for the forest trail and was able to keep on the trail even though it is covered by 6-9" of snow, however, within a few hundred yards regretted my decision as it was extremely difficult trudging through the snow. 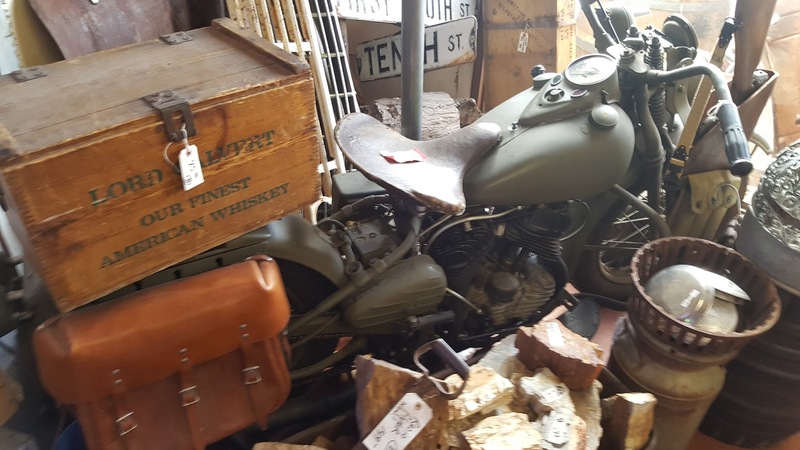 Nonetheless, I arrived at work, albeit huffing and puffing, at my usual 7:25 am, quickly punched the clock and got on with another 'unbusy' in the General Store. Don't get me wrong....I'm not complaining about it being 'unbusy'......I actually like being able to have time to read my book and get paid at the same time. Right now it seems as if I am a caretaker just occupying a spot until the next wave of seasonal workers arrive. The NPS requires that our store be open 7 days a week, 365 days a year, and that we be open in the winter from 8 am to 5 pm. It would make more sense to open at 9 am like the Watchtower and Trading Post as 9 out of 10 days we do not get our first customers until 9:30, or 10 am. We really could change our hours to 10 am to 4 pm and hardly miss a beat, or lose any noticeable income, but those decisions are for people way smarter than I. Once again most of the cash I dropped on Sunday at the end of my shift came in the last 90 minutes. I ended up dropping $134.43......TLE dropped about $270. I was home by 12:35 eating my 1/2 sandwich TLE prepare for me, and then taking one nap after another the rest of the afternoon. We've been socializing a lot the prior three days and I think that has kind of worn me down, even though I have thoroughly enjoyed our time with John and Lisa. They will be here until Tuesday, so we've got one more night to enjoy with them. There isn't much on TV Sunday nights so we watched an episode of 'The Crown', and then watched a couple of episodes of 'Godless', both Netflix original series. 'Godless' had been recommended to us by several people so we thought we would take a peek. So far we like it. Desert View - Day 107 - Will it melt? 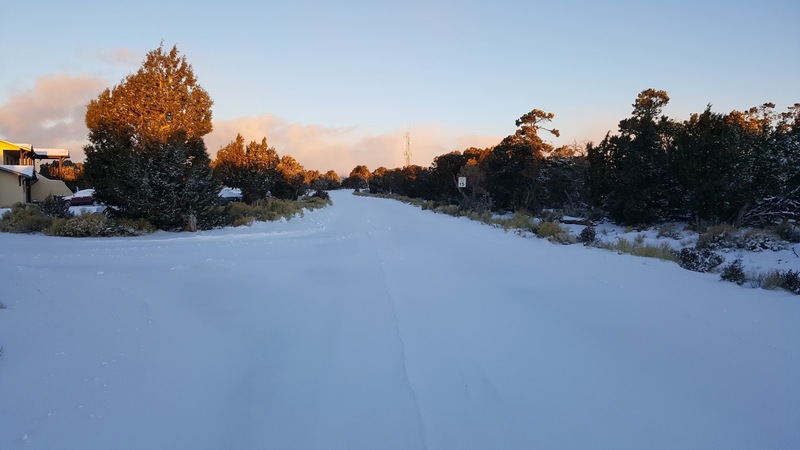 5:47 am - Sunday - February 25th - Grand Canyon - 19º F, 51% humidity, wind 2 mph out of the west.....forecast is once again for sunny skies with a high of 36º F.....more snow by Tuesday. With so much snow still on the ground and local roads I was in doubt as to how many visitors we might have Saturday, but by the end of the morning the Deli was packed and we had about 10 people in the retail section shopping, so as noon approached I knew I was leaving TLE in good hands with plenty to keep her busy. Friday (we were off) had been so 'unbusy' that the employees spent their time building a puzzle, and came close to finishing it. .......they were back around 5 pm to pick me up and drive me over to pick up TLE from work after which we went back to their Montana 5th wheel for the evening for dinner and more conversation. John grilled some rib eye steaks while Lisa provided sides of baked potatoes, green beans and salad. We had another wonderful evening, but by 8:45 it was time for us to head home as I had to be in bed by by my usual 9:30 so I could be up again Sunday morning at 5:15 am to get ready for work. We are now down to exactly 3 weeks until our departure from Desert View. The time is going by so quickly now....I'm wondering if the snow will all melt by the time we begin to pack things up.....I hope so.....I really hope so! 5:38 am - Saturday - February 24th - Grand Canyon - 8º F (feels like 1º F), 78% humidity, wind 3 mph out of the east.......forecast is for sunny skies and a high of 33º F. We ended up getting over 8" of new snow Friday to go with the 6" of snow we had last Monday. I am beginning to think we will have snow on the ground the rest of the time we are here. On a positive note my water line has only frozen twice (at the spigot) since last Monday, so things are good on that front. 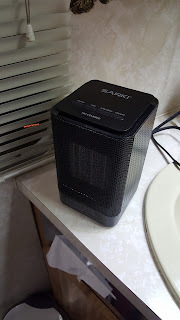 On the other side of the coin we have been rocking 4 electric heaters (including the one in the water bay which is keeping it at a cozy 45º) since Monday with nary any time when they were not all going full blast. We slept in Friday until after 8 am, and for the first time in a long time just lay there in bed snuggling and talking as the outside light began to penetrate our bedroom curtains.....a nice way to awake. We lazed around most of the morning watching the snow come down hour after hour and watching the Winter Olympics. It began snowing sometime around 4 am and continued pretty steadily until after 4 pm. ......we decided at that point to continue the conversation Saturday afternoon after I get off work, bid our adieus and walked slowly back home......the skies had cleared and it promised to be a bitter cold night with temps in the single digits once again. 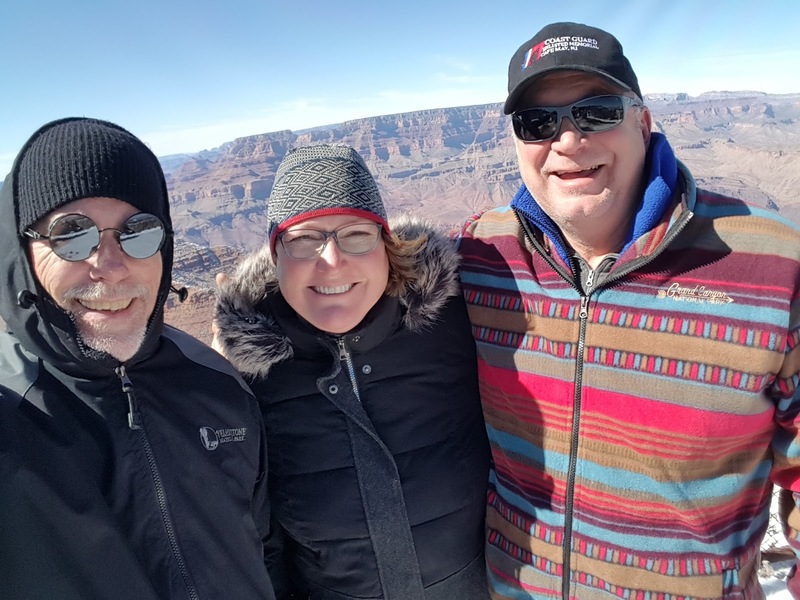 Having John and Lisa travel all the way from Colorado to visit us during a winter storm has been very special, and is one of the highlights of our time here at the Grand Canyon. I am so happy the passing of decades has not dimmed our friendship. In my mind Lisa is still 17, or 18 years old......the last time I saw her in the flesh, but now we are both well past middle age. During those years her mother, Jan, has passed on, but her father Gary is still with us and will be 80 years old soon.....my, oh my! .....it's a good thing we don't have to go to work today as it would be a brutal walk. We are under a 'Weather Advisory' until 5 pm. We were up by 7:30 am....nice to sleep in past 5:15 am.....I ran through my morning ablutions and around 10 am I walked down Colter Lane to inspect RV site 4 where our friends, John and Lisa, would be staying in their 36' foot 5th wheel when they arrived later in the day. We had gotten permission from the housing folks for them to stay in one of the empty employee sites while they were here as the next nearest campground is 25 miles away at the South Rim Village, and with a snow storm coming in they would probably not be able to make the drive over to see us. The electric was on, but no water was coming out of the spigot....I suspected the pipe had frozen. I wasn't sure if we could move them to site 5,6 or 7 so I sent Lisa a message that they needed to arrive with a full fresh water tank just in case. I would need to talk with someone in housing to see if we could move them to one of the other sites where the water was working, but couldn't do that until the afternoon. 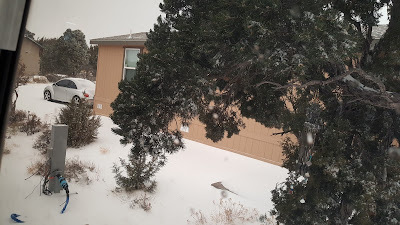 I had another followup doctor's appointment in Flagstaff at 1:45 pm so we were out the door and on our way south by 12 pm arriving at the doctor's office by 1:20 pm. The skies were clear and the scenery was, as always, spectacular. I was finished with my doctor's appointment a little after 3 pm so we headed down to the local Fry's Supermarket to do some shopping.....seems like we are always shopping, right? Once we were done there we headed over to the local North Country Medical Center (the same people who run the Grand Canyon Clinic over at the Village) to renew my blood pressure medication prescription (lisinopril)....this time I asked if I could renew it for 90 days and was told yes....total cost for a 90 day supply was $10! I can renew it one more time for another 90 days, but will probably have to have i transferred at some point to SoCal as we will not be in Flagstaff in 90 days. I had been getting instant messages all day from Lisa updating me on their ETA and it looked like they would be passing through Cameron about the same time we would on our way home from Flagstaff. We left Flagstaff around 4 pm, and were in Cameron about 4:45. 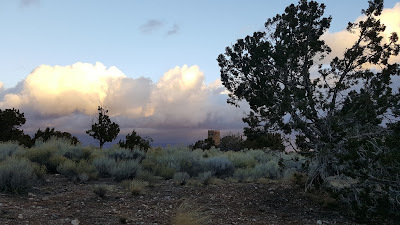 We had decided to go through the 'Drive Through' at the local Burger King to get dinner and while we were getting our hamburgers I got a message from Lisa they were leaving Cameron to go up the hill to Desert View. As I turned around in the car I saw their 5th at the gas station right next to the Burger King....what timing! I forgot to mention that while I was waiting to see my doctor I called Scott in the housing department and got permission to move John and Lisa to site #5, but wasn't sure if the water was working in those sites either. After exchanging greetings with John and Lisa we left them to top off their diesel tank and headed up the hill. Our first stop after arriving at Desert View was to check the water in sites 5, 6 and 7 and found that the water was working in all three so I sent Lisa a message to take site #5. We had barely unloaded the groceries when I got a final message from Lisa saying they had just passed through the park gates so I jumped in the VW and went to site #5 just in time to see them getting ready to back into the site......perfect! I left them to setting up their RV with the promise they would come over as soon as they were done setting up things. They were knocking on our door a little after 6 pm, and we sat talking for about an hour before they decided to head home for the night.....they had a long day of driving. Always so great to visit with good friends with more visiting to come! We watched the women's figure skating finals (long program).....all the USA skaters fell during their routines and finished off the podium......no medals. Two Russians finished 1st and 2nd and they truly deserved the their medals.....perfectly executed programs......something we used to associate with the USA women.....sigh. 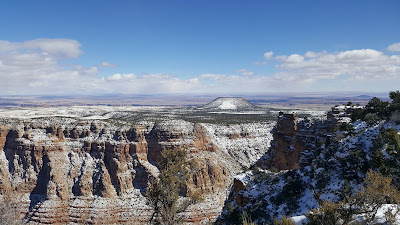 7:51 am - Thursday - February 22nd - Grand Canyon - 8º F, humidity 79%, wind 2 mph out of the west by southwest......partly cloudy with a forecast high of 35º F. It is Thursday and we have two days off work. Wednesday was our Friday.....actually more like Saturday, as it was our 6th consecutive day of work without a day off, but we needed to change our days off from Wednesday/Thursday to Thursday/Friday, so what are you going to do? When I left to walk to work it was still single digits temp wise....I was bundled up with four layers against the bitter cold, plus I was wearing my snow boots for the first time this winter. I should have worn them Tuesday as my toes were like small popsicles by the time I reached the General Store. On this day my toes and I arrived at the store in good condition. Since people had been tracking in melting snow all day Tuesday I spent the first 90 minutes Wednesday wet mopping up the mess. It's kind of like "Why wash the dishes? They're just going to get dirty again", and that was going through my mind as I mopped. I knew that within an hour everything I was doing would be undone due to no fault of anyone, but it had to be done, right? We actually had some customers before 9 am, and I was kept semi busy all morning before dropping $135.26. As I was getting ready to pull my drawer the auditors from the main office showed up to count out each cash box in the back, including mine. I couldn't go back there to count down my drawer while the auditors were there counting so I began counting down out at my cash register.....big mistake. There are too many distractions out there, and I made several mistakes necessitating recounting my cash several times. When I finally thought I was done, and had it right, I pulled the drawer out of the register and found two dimes and one nickle underneath the drawer........I had no idea if these coins had been included in my count, so I had to recount my dimes and nickles, and had to adjust my deposit amount (they were NOT included, as it turned out in my original count) from $135.01 to $135.26. In all it took me 45 minutes to successfully count out my drawer, and I didn't clock out until 1:01 pm. When it snows I do not walk through the forest as the trail becomes invisible, and it is easy to get lost. I attempted to walk the trail Wednesday, but within a 100 yards of leaving the road I lost the trail so I retraced my steps and walked the road to work. On my way home I was determined to attempt to walk the trail without getting lost, and this time I was successful. For some reason the trail is more obvious to me outbound from the store than it is inbound. Once again it was too cold to do anything outside, but I did spend time checking the heat tape on both the water spigots......for the first time in 6, or 7 weeks our water line froze.....not the heated hose, but at one of the spigots. Everything seemed to be in order so I guess if it gets cold enough for long enough there is not much I can do about occasional freezing. 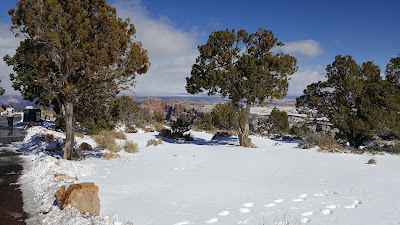 I keep our fresh water tank full when we are camped for a long time, so all I have to do is turn on the water pump and we have water until the line unfreezes, which it did about mid morning according to TLE. I spent the rest of the afternoon reading and watching more Winter Olympics coverage. TLE was home a little after 5:30 at which time we were officially beginning our 'weekend'. I tried to stay up long enough to watch the entire women's hockey final between the USA and Canada, but by the beginning of the third period I was falling asleep in my chair, so I went to bed. At that time the USA was losing 2-1, and didn't look like they had enough left to win the game, but win they did in 'shootouts' after remaining tied through one overtime. Congratulations USA! 5:38 am - Wednesday - February 21st - Grand Canyon - 7º F, 66% humidity, wind 2 mph out of the south by southwest.......forecast for today is cloudy with a high of 34º F.
.....it took me a little longer than the usual 10 minutes to reach the store as I walked the road all the way to work. I may, or may not have mentioned in yesterday's post that SR-64 over to the Village was closed Monday afternoon, and it remained closed until noon time Tuesday. As a result we had a few people visiting the store who were waiting for the gate to be opened. Some waited up to 5 hours before they were able to proceed westward. All that being said the store was very 'unbusy' once again Tuesday morning.....I dropped a grand total of $16.09. Now TLE was another story.....she dropped over $700.....once the gates were opened it got very, very busy the rest of the day. ....we had a nice sunny day, but the high was only 31º F, so there wasn't too much of a snow melt. By time I walked home the roads had all been plowed and I was able to walk on asphalt most of the way. Since it had been snowing so hard on Monday I was not able to dump the black tank as is my habit, so that got put off until Tuesday afternoon. Usually it takes me about 10-15 minutes to dump the tank and flush it out a few times, but on this day it took close to an hour. Everything was frozen including the hose I use to flush the black tank. I had to remove that hose and replace it with another in order to flush the tank. Fortunately I was able to stand in the sun waiting for the black tank to fill up each time with fresh water. I was done with the deed by 4 pm, and spent the rest of the afternoon reading, and watching Winter Olympics coverage. TLE didn't get home until 5:35 pm.....a lot of people came into the store right at the end of the day and kind of set her back about 15-20 minutes in her closing process. The prime time Olympics coverage featured the women's figure skating competition. All three of the U.S. women who have a chance to earn a medal fell during their routines.....I have never seen so much 'falling' in Winter Olympics figure skating as there has been this time around. I feel bad for these young kids who are over hyped by the U.S. media and seem to crumble under the pressure of their expectations. In other action the U.S. hockey team was defeated by the Czeck Republic in a shootout and eliminated. Lindsey Vonn came away with bronze in the women's downhill competition becoming the oldest woman to win a medal in Winter Olympics alpine skiing competition at age 33. As is the norm, I was in bed by 9:30 pm......less than four more weeks of getting up way too early in the day.....thanks for stopping by! 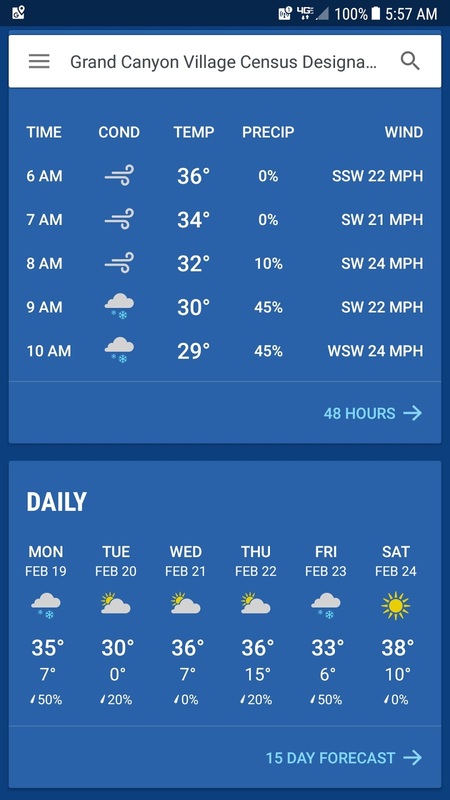 .....forecast high for today is 30º F with a low tonight of 3º F.....there is still snow looming out there on Friday.....up to 60% chance of snow now. I began my walk to work under partly cloudy skies with winds in the 20's knowing that by mid morning, or earlier, it should begin to snow, and snow it did. Our forecast was for just a 'trace' of snow, but we got a boatload. By 9 am a very fine snow was falling from the windblown skies, and by 10 am it began to get very serious. 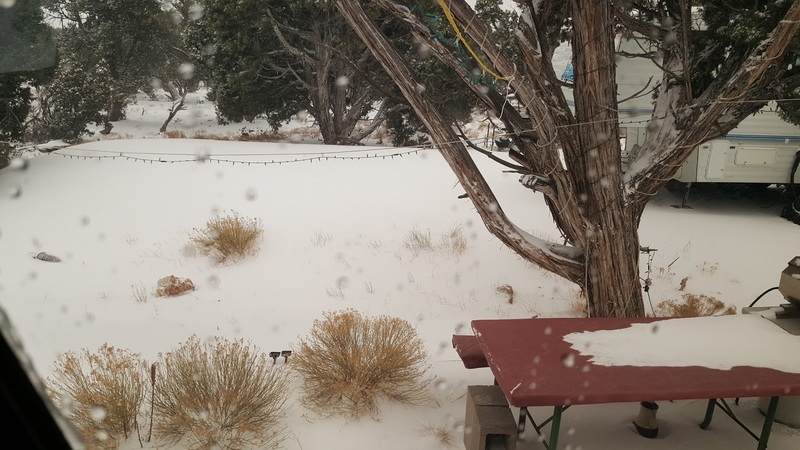 By 12 pm they were beginning to close the road between Desert View (SR-64) and the Village, and by 12:30 pm there were numerous accidents on that road including a truck jack knife. So much for the "trace" of snow, right? As might be expected, it was not very busy Monday....I dropped just $97, and TLE dropped $110. That there was anyone arriving at Desert View in that heavy snowstorm was remarkable. I clocked out from work about 12:25 pm and got a ride home from Scott, our receiving supervisor, in the company truck. 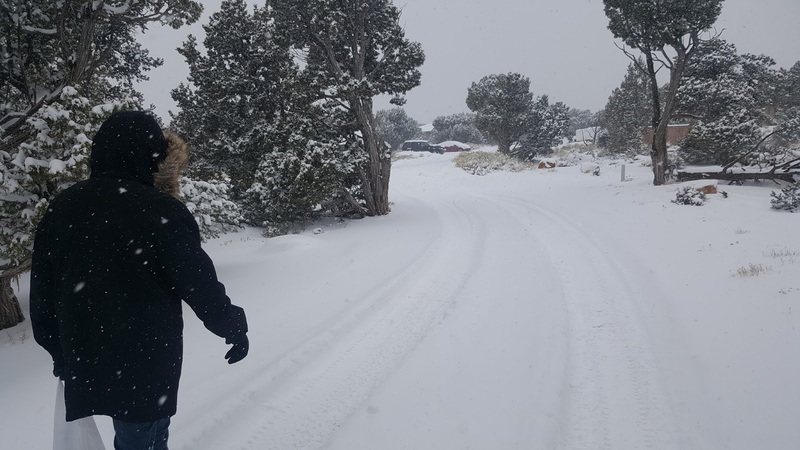 The snow was deeper than I had previously seen here at Desert View, and I am glad I chose to accept the ride......by the time I left it was near whiteout conditions. During the course of the afternoon, according to TLE, the Deli began to fill up with refugees from the storm. 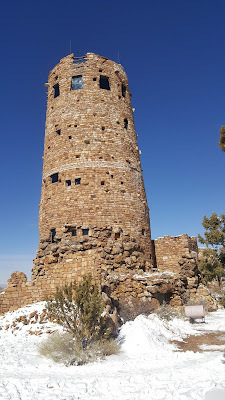 At one point the NPS (National Park Service) had planned to set up an emergency shelter in the Watchtower should the snow not stop in time to clear the exit road. As it turned out the snow did stop around 3 pm, and they were able to evacuate the 30 or so people stranded in the Deli by 4:30 pm. ......needless to say, I spent the entire afternoon inside the Newell.....well, I was outside for about 30 seconds relighting the water heater pilot light which had been blown out by the winds before I got home.....have to keep the water heater lit to be sure the water in it doesn't freeze. 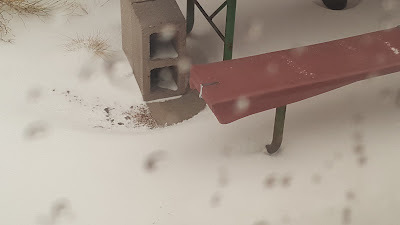 By the time I took the above pictures our sewer hose was completely covered by snow.....the top of the sewer hose is about 6" above the ground. Once the snow stopped our heated water hose did not stay covered with snow long as it is, after all, heated. As I wrote earlier, the snow stopped around 3 pm, but the wind continued until about 6 pm. There were times when I couldn't see the street behind our trailer the snow fall was so heavy. 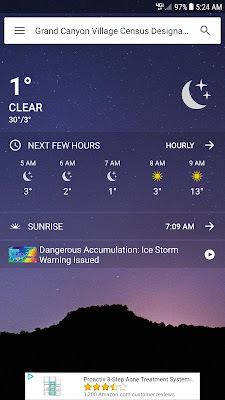 Once again, even with temps in single digits, our water line did not freeze, so we've got that going for us. TLE was home before 5:30.....she also got a ride home from work from Scott. She had decided not to drive the VW to work due to the depth of the snow at 11:30.....the VW is very low slung and there is not 6" of clearance. Good decision TLE! We spent the evening watching the Ice Dancing Long Program finals. All the performances where exceptional, and there were very few mistakes on the evening. Canada came in first, France second, and an American sister/brother team came in third. I was in bed at my usual 9:30 pm hoping the water hose would not freeze (it did not in spite of temps getting down to 1º by 5:30 this morning).....thanks for stopping by! 5:49 am - Monday - February 19th - Grand Canyon - 35º F, 67% humidity, wind 22 mph.....OH YEAH......rocking the motorhome all night kind of wind, and still rocking the motorhome kind of wind as I write. 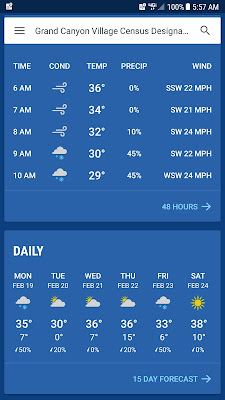 Pretty sure it got into the 40's a few times last night.....forecast high is also 35º F.....wait, what? So we've already seen the high for today? Sunday was day two of the 3 day President's Day weekend, and while it was not quite as busy as Saturday it was very busy.....at least for those who worked after 12 pm......before 12 pm it was very unbusy and the result was a $97 cash drop for moi. Initially it was windy, but the wind all but disappeared by 9 am only to return in force after 1 pm, and continued in force all afternoon, all evening and into the early morning hours and should continue until 5, or 6 pm Monday. .......four of the next 5 days will see single digit lows with Tuesday getting down to ZERO, and there's the snow forecast for mid morning Monday, and then again on Friday......forecast right now is at 50% chance of snow on each day. This is the first time we have seen a whole week with highs in the 30's. My morning shift was quite tame, and I spent time reading a book the last two hours. TLE was right there on time as always, and just as I was counting down my drawer it began to get busy. TLE reports dropping close to $700. I understand the Deli was so busy Saturday that they ran out of food by 4 pm, and had to close 40 minutes early. Just after I finished my walk home it began to get windy, so there was not much to do outside.....I did manage to ride my stationary bike for 30 minutes, but otherwise I spent the afternoon inside. TLE was home a little after 5:30, and we were eating dinner at 6 pm. There wasn't much on Winter Olympics wise on TV that interested me, so I spent time watching 'Naked and Afraid'. Desert View - Day 100 - 100 - 100 - 100! 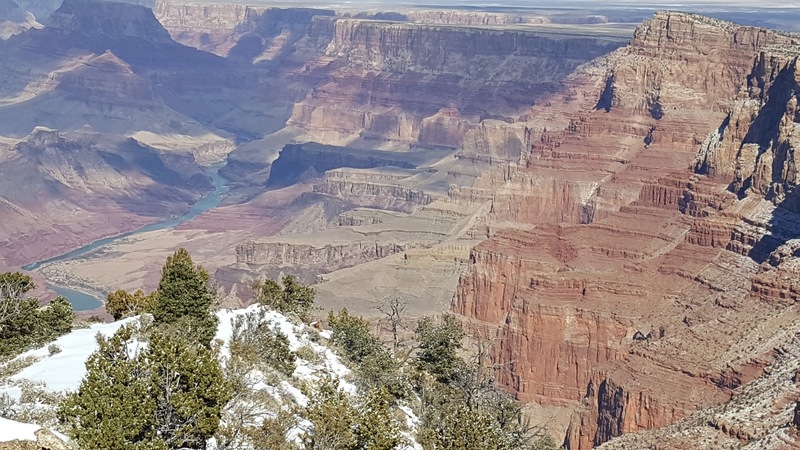 5:35 am - Sunday - February 18th - Grand Canyon - 27º F, humidity 83%, wind 6 mph out of the southwest.....seems stronger than that. It was very windy all night, and it looks like we'll have wind all day Sunday and Monday, with a chance of snow on Monday. Forecast high for today is 51º F with clear skies. As I sit here at my Lenovo laptop keyboard Sunday morning I cannot help but notice I am writing about Day 100 here at Desert View. As I have oft commented, it does not seem like we have been here very long, but the calendar does not lie......we arrived here on November 6th 2017 and now here it is February 18th 2018. Another number which presents itself this day is that in exactly four weeks from today we will be done with our contractual commitment to Delaware North, and moving on to our next adventure. Not surprisingly, Saturday, the first day of the President's Day weekend, was quite busy. I dropped around $227 in cash, but TLE dropped over $800! My work day at the General Store began with me dry mopping and then wet mopping the entire store as it had been 5 dayS since that had been done. I barely finished when the customers began to drift into the store, and business remained steady the rest of the morning. As TLE was arriving just before noon it got very busy so I stayed at my register an extra 15 minutes while both of us processed our customers through the check stands. That has not happened since the Christmas/New Years weekends. The forecast high for Saturday was 53º F, and with an absence of any kind of wind, or breeze it felt much warmer. I even opened a window in the Newell Saturday afternoon for about an hour. The freshly drilled hole for the cord to pass through.....a GOOD idea! .......it took less than 10 minutes start to finish, and now I don't have to worry about an electrical fire anymore. Shortly after finishing my small project I changed into my riding clothes and rode my stationary bike for 30 minutes. By the time I finished 'riding' it was after 4 pm so I sat down to finish another book before TLE arrived home from work. 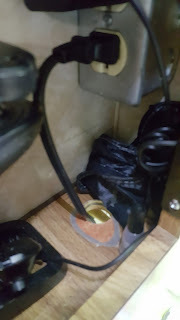 I had noticed when I first arrived home that TLE had something cooking in the crock pot, and it turned out to be potatoes. When she arrived home she put the potatoes into a blender and within 30 minutes had this wonderful beer potato soup for dinner....she apparently used one of my Oak Creek Brewery Amber Ales to make the soup......I'm always willing to sacrifice a good beer for good food....any time! We watched some Winter Olympics coverage on TV, and by 9:30 pm I was heading off to dreamland once again......thanks for stopping by! 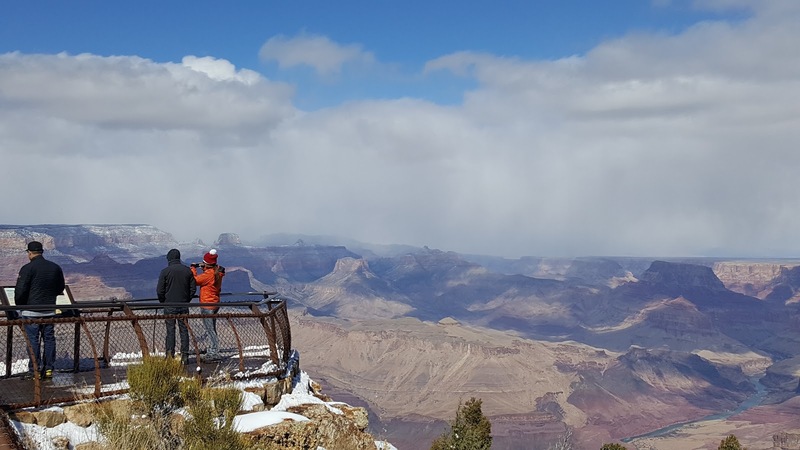 5:38 am - Saturday - February 17th - Grand Canyon - 18º F, 80% humidity, wind 2 mph out of the east by southeast......clear with a forecast high of 53º F today. After our two day blowout in Flagstaff I had a difficult time getting up Friday.....usually I'm up between 5:20 and 5:30 am, but on Friday I didn't wake up until 5:41 am.....that 10-15 minute time difference makes a big difference! Nevertheless, I was dressed and ready to walk by 7:13 am, and at work punching the clock by 7:25 once again. Over the two days we were off work they completely re-organized the retail section of the store (souvenirs, t-shirts, jackets, scarves, etc.). By 'they' I mean people way up the corporate food chain came into the store and applied their expertise to our retail space. This is the third time we (the royal we) have rearranged the retail section since we arrived November 6th. Business was quite slow for a Saturday on the President's Day weekend, and really until the last 15 minutes of my shift my cash sales were under $30, but in the last 15 minutes we had about 25 people from a tour bus enter the store. By the time I finished ringing up their sales my cash deposit was over $127. The other 4 hours and 45 minutes of my shift I spent reading a book and handled 3, or 4 customers in total. TLE was right on time as always, and I was on my way home driving the VW by 12:25. Why is that you might ask? Don't you always walk? Well, yes I do, but on our trip down to Flagstaff I experienced problems with adjusting the driver's seat.....when you pull the little latch you can move the seat forward and backward, and when you release the little latch it is supposed to lock into that position, only it wouldn't. Trying to drive a car with you seat moving forward and backward is not fun! 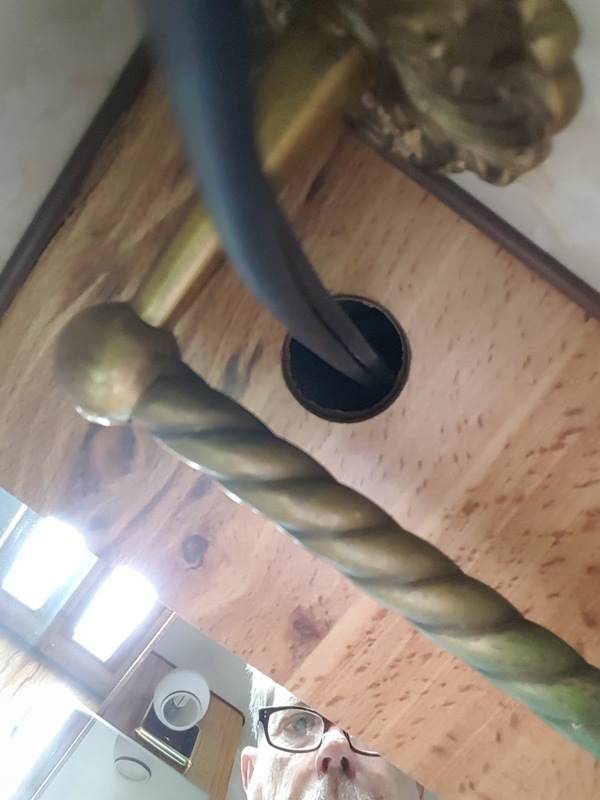 Eventually it did lock into position, but then on the way home it began to act up again so it was time to apply the Hockwald magic to that misbehaving latch and get it working properly again. Hence I drove home to work on it while it was still warm and there was plenty of light. Of course 'warm' is a relative term nowadays.......the high was 43º F around 3 pm. After eating lunch (the other half of my Subway sandwich from Thursday) and taking a nap I put on warmer clothes and went out to the VW around 2:30 pm to deal with the miscreant seat latch. 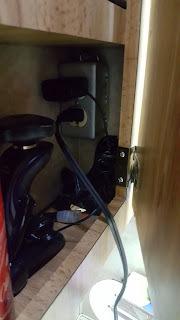 It took about an hour, but I finally figured out the latch part that engages the steel frame under the seat to lock it in place needed some lubrication, and after applying liberal amounts of silicon in the form of aerosol spray it began to function properly once again. After fixing the seat I changed into my riding clothes and spent 30 minutes on my stationary bicycle at which time it was well after 4 pm and approaching the time I would need to drive back to the store to pick up TLE after her shift. All in all it was a satisfying afternoon.....nothing like being able to fix something successfully without having to redo it three times! TLE was out the back door of the store before 5:20 pm and we were on our way home for the evening. We first watched a 2 hour recorded episode of 'The Amazing Race' then a two hour recorded episode of 'Gold Rush' before turning on the Winter Olympics. Nathan Chen managed to rebound from his dismal short program performance to complete 6 quad jumps in his long program.....when I went to bed at 9:30 pm he was in second place with 4 skaters to go....he ended up finishing in 5th place, but won the long program. 6:07 am - Friday - February 16th - Grand Canyon - 19º F, 77% humidity, wind 3 mph out of the south by southeast.....forecast high for today is 47º F with partly cloudy skies. It just occurred to me yesterday that I had made no mention of our nomadic anniversary back on February 1st. On February 1, 2011 we began living full time in our Newell coach, and on February 1, 2012 we began our lives as nomads...... it does not seem possible we have been nomads for 6 years now, and have been living in our Newell for 7 years. I was awake Thursday morning by 7 am.....just can't sleep past that time for some reason. When I opened the curtains I could see that much of the snow at the park across the street had melted, and the streets were clear. TLE was up a few minutes later. The Residence Inn puts on a very nice breakfast.....a full breakfast bar if you will....we headed down about 8:30 to eat and found almost all the tables taken, so we hurried to get our food, and managed to grab a couple of the last seats. I was kind of surprised at how full the hotel was on a Wednesday/Thursday in Flagstaff of all places. Just two weeks ago in Prescott there were like 3 other people eating breakfast on a Thursday morning. .....the entire store was full of very interesting stuff, but nothing we without which we could not live! In all we visited 4, or 5 stores finding a couple of things we could not live without before it was time to get lunch, and then head to my doctor appointment. The Subway shop we ate at last week is very near the medical center so we went there to eat once again. By the time we finished with the doctor appointment, which went very well by the way, and had fueled up the VW once again it was about 2:50 pm and time to head for the barn. We were home shortly after 4 pm after a completely uneventful drive home on US-89, and SR-64. The skies were clearing from the storm, and the view north on US-89 was spectacular. We finished out the day watching more Winter Olympic coverage with me being in bed by 9:30, as is my custom on days when I must be at work by 7:30 am.....thanks for stopping by! Desert View - Day 88 - Just a nice day! Desert View - Day 84 - Get 'er done!